It has once been said that children are like animals. They won't do anything you tell them to do, yet they will do something you won't. Still. It could be a lot worse I suppose! 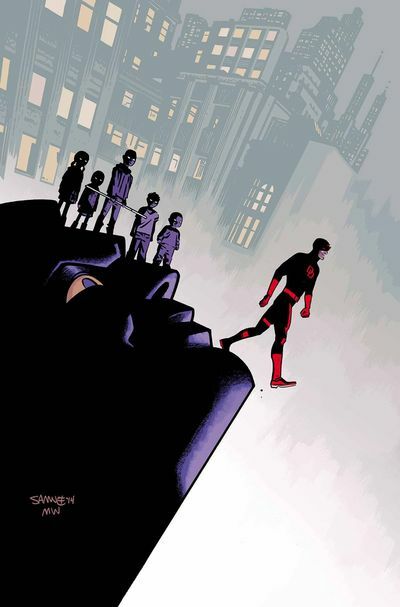 Your kid could be like one of those brats featured in the following adventure Created by: Mark Waid, Chris Samnee, and Published by Marvel, in October, 2014. To QUOTE Tom Stoppard: 'If you carry your childhood with you, you never become older'. So there he was, Matt Murdock, talking to Foggy Nelson and Kirsten McDuffie about his new book deal with Kirsten's estranged father. When suddenly, out of the blue, they all see purple! No. It isn't the purple pose of that plonka called Killgrave. He got shafted last issue, remember? It's his purple progenies instead. Killgrave's children. Who try to do to Matt what they once did to their dear old Dad. Kid's today, eh? No respect. As most of you most probably know, by in large I've loved reading every single issue of this series so far. 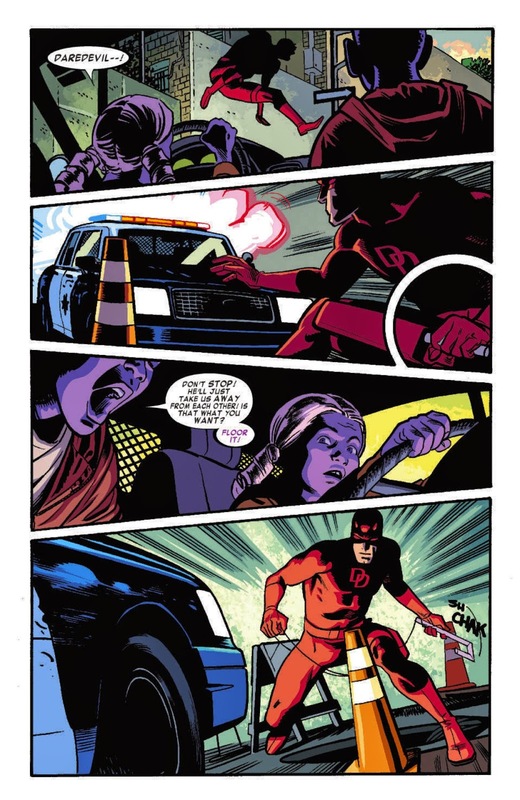 Mark Waid's story-lines have always been original and full of life. Where as Chris Samnee's artwork has always been well defined and full of character. In this case though, dear reader, well, yeah. Once again I loved Chris' art-work. And to a certain extent I loved the story-line too. Especially that scene where Foggy was wearing the fat-suit, as well as the way Matt and company talked about what he should do about his new book deal. ... I'm afraid to say that the only problem I had with this issue is that it was too quick a read. I mean, once it eventually started to edge its way into this sub-plot, all of a sudden the kids somehow managed to kick Matt to the curb, and that was that. Game over, folks. And we have to wait for another month to see what's going to happens next. It's a shame, really. Cause I honestly found the Purple kids and their father a great part of this premise. It's just that there wasn't enough of it in this installment. Not enough purple at all. Do you know what? My previous answer has given me a great idea on how to answer this section. So stand back, dear reader, and allow me to present to you Deep Purple's seventies classic, 'Child in time'. What? Was this musical match-up too literal for you? Wait a minute! 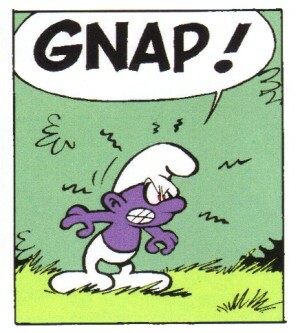 Once again my previous answer has inspired me to come up with another piece of cr*p. So once more, may I allow myself to I say that this comic book reminded me of a small purple person who resembles a... oh! So you've already seen that picture of the angry purple smurf provided! OK. Fair enough. At the very end of this issue Matt comes face to face with someone who might be able to turn the tide of this battle. So just for fun, can you guess who it is out of the following eight suspects? Doctor Doom -- Now that would be interesting. Katy Perry -- Well, she did say she wanted to have children someday. The Parasite -- OK. So he might be a Superman villain. But at least he's purple. Justin Bieber -- Noooooo! Anyone but him. The Purple Man -- Wait a minute! Isn't he supposed to be dead? Barry Manilow -- See previous answer for more details. Deep Purple -- Hey! That would be a nice twist! God -- Heaven preserve us!